The Battle of the Heligoland Bight was the first ""named"" air battle of the Second World War, which began the longest air campaign of the war, the Defence of the Reich. On 3 September 1939, the United Kingdom declared war on Nazi Germany after the German invasion of Poland, which started the European War. The British did not assist Poland by land or sea, but over the ensuing weeks, RAF Bomber Command flew several missions against German targets. A number of these air raids were directed at Kriegsmarine (German Navy) warships in German ports to prevent their use in the Battle of the Atlantic. With the front lines static between September 1939 and May 1940, a period known as the ""Phoney War"" set in, with little fighting on land or in the air. However, at sea, German U-boat (submarine) forces were taking a considerable toll on Allied shipping. The Air Ministry decided to launch an attack on German surface ships to prevent them supporting the U-boats in the North Atlantic. On 18 December 1939, a force of three RAF bomber squadrons were sent to engage German ships in the Heligoland Bight and sink or damage as many as possible. Originally 24 Vickers Wellingtons took off. Two turned back owing to engine trouble before reaching German airspace. The German reaction was slow. Eventually they scrambled strong fighter aircraft forces to intercept. 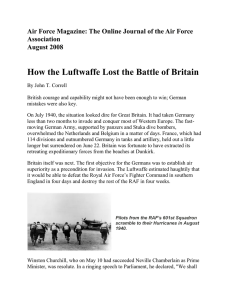 Just over 120 aircraft, 80–100 German and 22 British, were involved but only 44 German fighters made contact with the British bombers.The Germans inflicted more damage on the RAF than the Luftwaffe received, but its influence on both sides' future strategy was profound. The battle forced the RAF to abandon daylight missions in favour of night bombing as casualties were too high. In the build-up to the war, the RAF had adopted the mantra that ""the bomber will always get through""; but in daylight the Heligoland battle had shown this was not the case and it forced a reappraisal of future bombing operations. 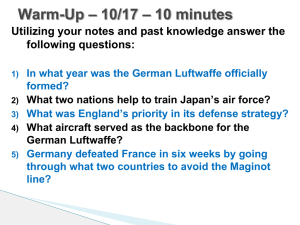 The failure of the raid led the Luftwaffe to believe its base in Germany proper was invulnerable to enemy attack. This belief was reinforced with the Wehrmacht's success in 1939–41, which meant that opposing air forces were then too far away for effective bombing attacks on the German homeland. Neglecting their day fighter force had serious strategic consequences in later years. By the time the Oberkommando der Luftwaffe (OKL; Luftwaffe High Command) had begun organising an air defence to combat the United States Army Air Forces' (USAAF) strategic bombing campaign, they were already engaged in a war of attrition for which they were not prepared. This oversight was one of the contributing factors in the defeat of the Luftwaffe in the Defence of the Reich campaign. 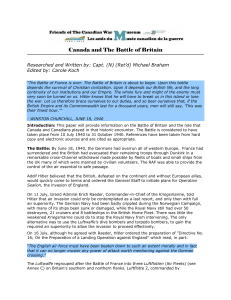 The German official history called the battle ""amongst the most important actions of the entire war"".